Many were in attendance for the Gilmore-Parkison family reunion: On Floor: Nevaeh Greene, Eli and Leia Liming, Jaylynn Bowermaster. Seated: Sue and Danny Gilmore, Barb Havens, Tom and Betty Gilmore, Mary (Babe) Donohoe, Margaret Lee Littler, Donna Liming. Standing Row 1: Phyllis Havens, Debbie Havens, Michelle Liming, Peggy Liming, Diana Littler, Teresa Lutz, Vickie Wagner, Sabrina and Jeromie Bard, Jacob Bard. Standing Row 2: David Havens, Gary Havens, Jennie Cunnagin, Donny Liming, Luke Liming, Donald Liming, Jamie and Jonathon Holley, Buck Wagner, Tom (Bud) Gilmore Jr., Amber Kirkman, David Lutz, Jonathan Wagner, Christine Delph, Tommy Wayne Donohoe. Amy and Elaine Gilmore were absent from photo. 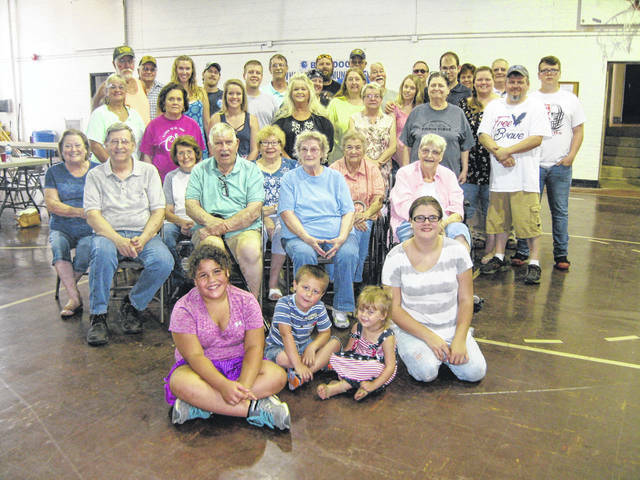 Descendants of Lote and Hazel Parkison Gilmore and Hazel’s parents Clint and Nora Milner Parkison held their family reunion on Sunday, June 24 in the New Holland Community Center. Everyone brought food and stories to share. Those attending were Mary (Babe) Donohoe, Buck and Vickie Wagner from New Holland; Tommy Wayne Donohoe from Fairfield, VA; Jonathan Wagner and Amber Kirkman from Lithopolis; Tom and Betty Gilmore, Jeromie, Sabrina & Jacob Bard from Circleville; Tom Gilmore Jr. and Christine Delph from Gatlinburg, TN; Theresa and David Lutz from South Bloomfield; Donna Liming, Donald, Peggy and Donny Liming, Jamie and Jonathon Holley, Jaylynn Bowermaster, Nevaeh Greene, Luke, Eli and Leia Liming, Michelle Liming, Jennie Cunnagin, Margaret and Diana Littler from Xenia; Danny, Sue, Amy and Elaine Gilmore from Columbus; Gary, Barb and Debbie Havens, David and Phyllis Havens from Frankfort. A lot of photos were taken. Sue brought some old photo albums from prior reunions and a military photo album that were enjoyed by all. https://www.recordherald.com/wp-content/uploads/sites/27/2018/08/web1_IMG_6102.jpgMany were in attendance for the Gilmore-Parkison family reunion: On Floor: Nevaeh Greene, Eli and Leia Liming, Jaylynn Bowermaster. Seated: Sue and Danny Gilmore, Barb Havens, Tom and Betty Gilmore, Mary (Babe) Donohoe, Margaret Lee Littler, Donna Liming. Standing Row 1: Phyllis Havens, Debbie Havens, Michelle Liming, Peggy Liming, Diana Littler, Teresa Lutz, Vickie Wagner, Sabrina and Jeromie Bard, Jacob Bard. Standing Row 2: David Havens, Gary Havens, Jennie Cunnagin, Donny Liming, Luke Liming, Donald Liming, Jamie and Jonathon Holley, Buck Wagner, Tom (Bud) Gilmore Jr., Amber Kirkman, David Lutz, Jonathan Wagner, Christine Delph, Tommy Wayne Donohoe. Amy and Elaine Gilmore were absent from photo.